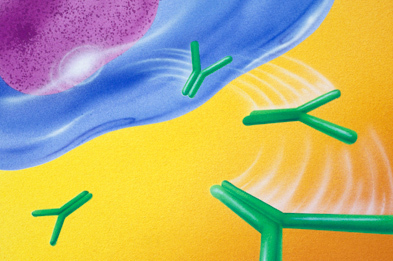 An antibody that targets B cells has moved a step closer to becoming the newest lupus treatment in over half a century, after meeting its primary end point in a second pivotal Phase III trial. Belimumab acts on B cells. Autoantibodies produced by these cells contribute to the pathogenesis of lupus. Benlysta (belimumab) inhibits B-lymphocyte stimulator (BLyS), thereby suppressing the development and activation of antibody-producing B cells. The drug is being jointly developed by GlaxoSmithKline and Human Genome Sciences. The BLISS-76 trial enrolled 819 seropositive patients with systemic lupus erythematosus (SLE). In addition to standard care, participants received belimumab 10mg/kg or 1mg/kg or placebo by intravenous injection on days 0, 14 and 28, and every 28 days thereafter. Treatment allocation was randomly determined. After 52 weeks, patients treated with the higher dose of antibody fared significantly better than those who received placebo. Response rates, as determined by the SLE Responder Index, were 43.2% in the 10mg group and 40.6% in the 1mg/kg group, compared with 33.8% for placebo. Belimumab was generally well tolerated, with similar rates of adverse events observed in patients who received the drug and those who were given placebo. The study continues for a further 24 weeks. In the earlier BLISS-52 trial, investigators randomised a similar serologically active group of 865 lupus patients to receive belimumab or placebo for 52 weeks. Response rates for the 10 mg/kg and 1mg/kg doses of belimumab were 57.6% and 51.7%, respectively, compared with 43.6% for placebo. The treatment difference relative to placebo was significant at both belimumab doses. "Based on the data we now have in hand, we have cause for hope that belimumab may emerge as a significant new treatment for lupus," said Joan Merrill, study investigator and Professor of Medicine at the University of Oklahoma Health Sciences Centre. An application for approval to market the drug in Europe is expected to be submitted in the first half of 2010.